Our baritone section consists of ‘Grandad’ Graham on Solo Baritone and Oliver Newrick on Second Baritone. Graham’s the eldest of three generations of his family currently playing with the band and his family connections go right back to the formation of the Band in 1853. Graham conducted the band for many years before handing over the baton to our current MD David, and these days helps our younger players and shares his vast experience. 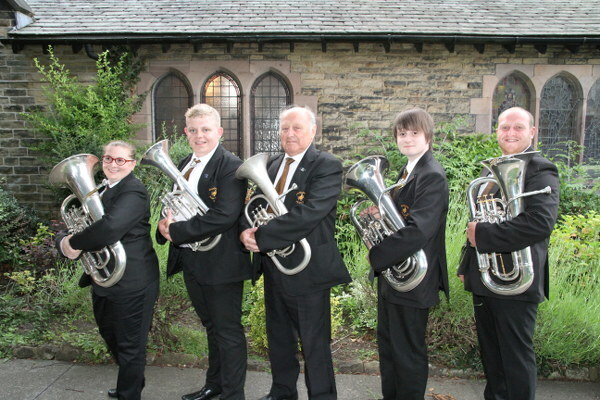 We only have a combined picture of our euphoniums and baritones so you’ll see this picture twice… left to right we have Kate, Oliver, Graham, Daniel and Nathan.